A unique insight into one of the many flamboyant eras of Italian style and fashion shared by the wonderful Margherita Gardella. Your fabulous mother Mariella had such a great career working for Vogue Italia with Guy Bourdin, Helmut Newton, Norman Parkinson; what has been her major influence on you and your work? So many memories… When I was very young I would occasionally accompany my mother Mariella Gardella to work, insisting I have my say as, at least in my own young mind, I was ‘assisting her’ whilst she styled, wrote and modelled for Linea Italiana; the renowned 1970’s competitor fashion glossy to Italian Vogue.My mother is my real inspiration, my mentor and my icon. I still learn from her today how to improve in our splendid business. We are so lucky to have her as The Protagonist’s Editor at Large. I was so fortunate in inheriting my mother’s artistic talents. She is well known amongst the Italian fashion cognoscenti as ‘la Gardella’; I was so delighted when it became known to me that they named me ‘la Gardellina’. It’s a family heritage I acknowledge with great pride and gratitude. How has your career evolved from Italy to England? I’ve been tutored by some of the greats in Italian fashion media; Franca Sozzani at Per Lui Magazine followed by L’uomo Vogue with the peerless director Cristina Brigidini, one of the great inspirations in my life. After several years at the heart of Condé Nast in Italy I moved on to Grazia Magazine. It was a creatively rewarding period to be working in Italian style, but my endless search for new curiosities and passion for the next thing led me to seek new style pastures… London was exploding with new ideas and at the heart of modern global artistic culture; I dropped everything and leapt onto a plane. It was this impetuous decision that led me to the wonderful, visionary, stubborn talent that is Andy Blake. London was the only place to be and to be accompanied in this heady city by someone like Andy and his beautiful partner Carolyn was a gift that I cherished at the time and have done ever since. Twenty-five years on and we all remain the closest of friends – family of our own choosing. Andy has always been a formidable fashion and style ambassador; from the Worlds End Chelsea punk era to styling Blockbuster films and illustrious Venice Biennale commissions. To see him focus his talents on Immortal is such a thrill. It’s going to be an exciting adventure to watch the brand build over the next few seasons. He’ll naturally have my unwavering support both as a friend and professional admirer. I, like many others, will observe Immortal with great interest. Which shoots have given you the biggest thrill? One of them was with Deborah Turbeville in Cuba, where we styled real people from the streets: I’ll always be thankful for her severe way of working and teaching me how to be a proper Fashion Editor. Another one was Ram Shergill in India with elephants on the beach! Pure madness and eccentricity – one of the reasons why I respect Ram and why we still work together at The Protagonist, absolutely a genius photographer. One special and crazy lady (like myself!) that I enjoyed working with is Zanna, shooting Haute Couture in her London studio; real and pure poetry, so modern now and forever. The last one I’d like to mention is Ruven Afanador, shooting Haute Couture in the Gare D’Austerlitz: what a great and fun production! I truly believe all these fabulous shoots are timeless. What would you say is the real difference in your approach between Drama and The Protagonist, the two most recent magazines you’ve been Fashion Director for? The main thing I would say is that The Protagonist is more mature, wiser and more intellectual; we are creating pages that are unique and not just for fashion victims! The Protagonist is now more of a collectable book – we still cry every time it comes out! To never stop learning, as my mamma always says, and to let the eye travel as much as possible. Your own personal style is… Everything actually, not just the latest fashion – to have personality is the real key. Your favourite film ever is… La Dolce Vita by Fellini, a real masterpiece. We even named our son Marcello after the genius actor Marcello Mastroianni. Your favourite artists are… Damien Hirst and Ercole Pignatelli, a unique Italian painter, still painting at 80 years old! Your style icons are… My adored mother and Diana Vreeland. Your favourite piece of clothing is… A vintage Courreges dress. 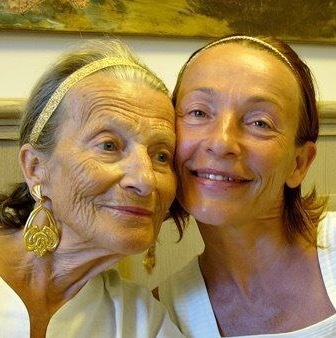 Margherita Gardella, pictured here with her mother Mariella Gardella, legendary fashion publisher and author. Whilst she is still often found perusing the side-street boutiques and fashion houses of Milan Margherita now spends most of her time at her lovely home Villa Metato enjoying the serenity of the beautiful Umbrian countryside.